Quip, which is owned by Salesforce, sees Slides as an alternative to Microsoft PowerPoint and Google Slides. Quip, the collaborative word processing app acquired by Salesforce for US$750 million, has added a new slideshow creation feature, further adding to its capabilities as a productivity suite. Quip was initially focused purely on word processing, but expanded its focus with the addition of a spreadsheet tool. Now, with the debut of Slides, the company has three of the basic components of major office productivity suites offered by Microsoft and Google. The idea behind Quip Slides is to allow creation of simple slideshows for team meetings rather than in-depth keynote presentations. That’s how such apps are most frequently used anyway, the company said. “Some of us practically live inside software that seems to be designed for rockstar keynotes—when in reality, we're using decks to run meetings, pitch ideas, and rally our teams,” the company said in a blog post. Slides lets teams co-edit slideshow presentations in real-time and use built-in chat to discuss the changes, just as they would collaborate using Quip’s other document types. Users can embed interactive charts into individual slides using data pulled from Quip’s spreadsheet tool, as well as live data from Salesforce and integrated third-party apps. Other features include feedback prompts such as questions and polls that can be added to slides to engage with audiences, while an analytics tool shows who has viewed the presentation and which slides were most popular. The strengths of Quip Slides lie in the real-time access to content and the ability to reduce or even eliminate the need for users to switch between applications to complete a task, said Raul Castanon-Martinez, a senior analyst at 451 Research. While Quip Slides can be seen as an alternative to Google Slides or Microsoft’s PowerPoint, it is not a direct competitor, he added, because of its focus on more targeted uses. 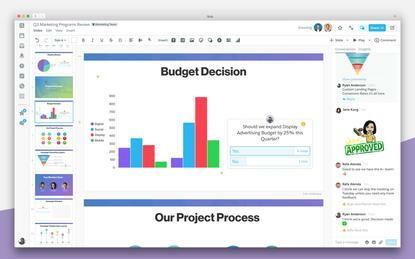 Salesforce has been pushing Quip as a collaboration hub – something rivals like Microsoft and Slack are also keen on - and a way to connect data from its cloud CRM product. “Salesforce has been steadily building out [its] collaboration portfolio as [it] enhances the way people interact with Salesforce systems of record,” said Alan Lepofsky, vice president and principal analyst at Constellation Research. That began with the launch of Chatter, but the roadmap has since evolved, he said, placing Quip, as well as its Community Cloud, at the center of its strategy. “Now a sales rep, marketing professional or customer service agent can create and share content that leverages live Salesforce data without having to use Google or Microsoft’s office suites,” said Lepofsky. 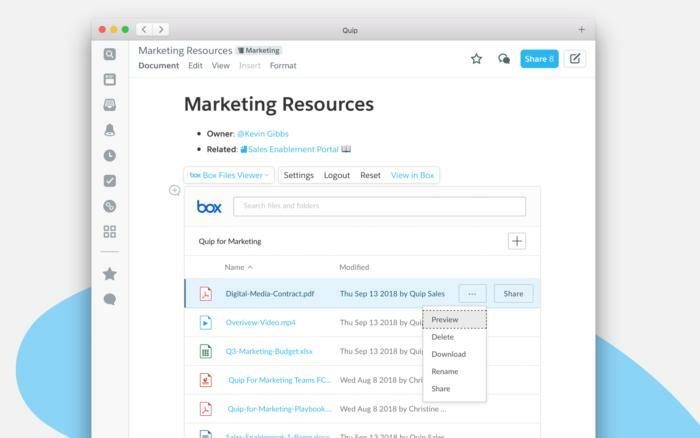 Quip is pushing integration with apps like Box and Dropbox in its software. Building on last year’s announcement, new Live App integrations for Quip were also unveiled this week. The Box Files Viewer Live App embeds Box files and folders directly into Quip docs, letting users manage, access and preview files without switching apps. A similar integration is available for Dropbox. Existing app integrations include Atlassian’s Jira, DocuSign, and Salesforce tools such as a calendar app and kanban board. In addition to making more apps accessible in Quip, Salesforce indicated plans to integrate Quip docs into its CRM tools, allowing for collaborative editing as a Salesforce Lightning component. That change is due next year, the company said. Quip’s user interface has also seen an update, with a redesign adding tabs to its desktop apps, as well as advanced search, revamped sidebars, a tasks drawer and an admin console.